Happy 2015! One my projects, Water Into Blood, recently released a full length album. You can check it out here. WIB is the brainchild of Brandon McCubbin, longtime Judgement Day crew member and walking metal encyclopedia. Jon Bush from Judgement Day plays drums, and I play cello on about half the tracks. We’re playing a free album release show at the Phoenix Theater in Petaluma, Friday the 13th(!) of February. fb has the info. On the classical front, my dear friend, Yuri Kye, and I are resurrecting on old project called the Chabot Chamber Society, and our first concert of the year is this Friday the 9th at the St. Joseph of Arimathea church in Berkeley (you know, across from the Durant Top Dog). 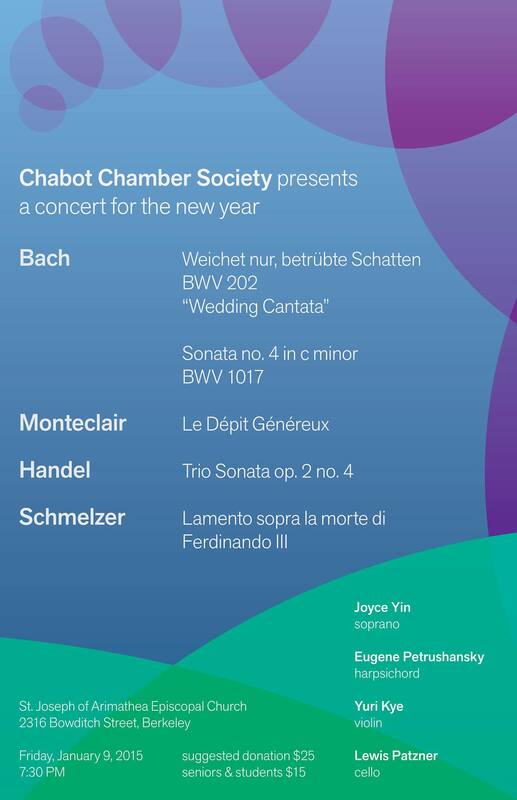 The program is all Baroque and will include the lovely Joyce Yin singing the Wedding Cantata by J.S. Bach and le Depit Genereux, a cantata by Monteclair. We’re also playing the Schmelzer Lamento Sopra La Morte Di Ferdinando III, the Handel Trio Sonata op. 2 no 4, and the Bach c minor Violin Sonata. Rounding out the ensemble is Mia Bella D’Augelli on violin, Ivo Bokulic on viola, and Eugene Petrushansky on harpsichord. We would love to see you there! more fb info.